If your next few days are anything like mine, then you are seriously busy. We are definitely in the holiday countdown mode over here and there just aren’t enough hours in the day to get everything done. The grocery shopping must begin, picking up out-of-towners at the airport is on the agenda, making pierogi, stuffed cabbage, kugel, sauerkraut, appetizers, desserts, picking out some wines and then it dawned on me last night I needed to wrap all the presents. I completely forgot. Thank goodness the house is clean, I wouldn’t have time to fuss with it. And through it all we still must eat. This is a great little salad recipe if you are having a sit down salad course, or maybe you need an easy lunch this week for your out of town guests. This would also do well for a dressy New Year’s Eve dinner as it would pair wonderfully with sparkling wine. The palate-cleansing bubbles and acidity of the sparkling wine will create a counterpoint to the creaminess of the goat cheese and taste delightful together. You’ll see. The fresh herbs in the goat cheese are such a nice touch and make this plating a wonderful addition to any meal. 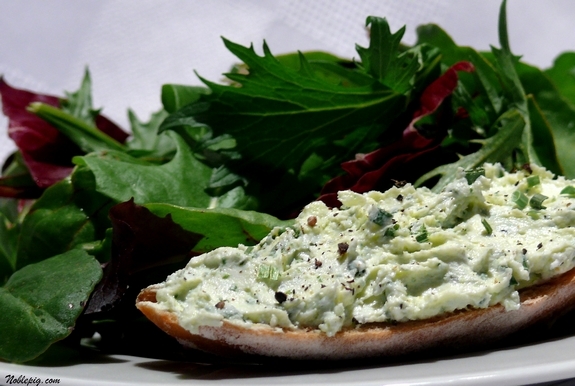 Put the goat cheese and 4 teaspoons olive oil in a food processor (or a mixing bowl with a wooden spoon). Pulse one or two short pulses just to blend. 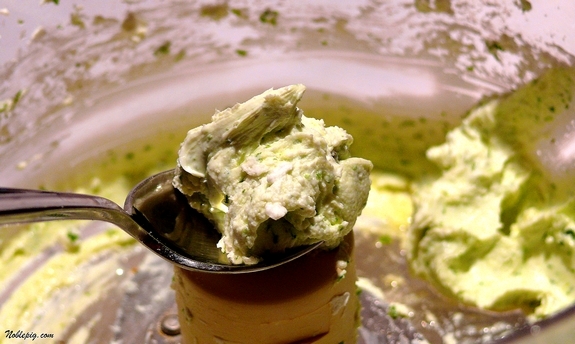 The mixture should be spreadable; if it’s too thick, add more olive oil and pulse again. Transfer to a bowl, and stir in salt and pepper to taste, the herbs and lemon zest. Chill for 30 minutes. Heat oven to 400 degrees. Place bread on a large baking sheet, brush lightly on both sides with the remaining 1 Tablespoon of the oil and bake until lightly toasted, about 4 minutes per side. Set aside. In a small bowl combine the vinegar, mustard, salt and pepper to taste and whisk to blend. Slowly whisk in the olive oil. Just before serving, add dressing to mixed greens and toss gently. Divide among 6 salad plates. Spread a nice schmear of the herbed cheese on the toasted baguette slices and place one slice on each plate next to the salad. Serve immediately. Light the candles and dim the lights, this salad says, “Dinner Party”. This sounds wonderful for the little Christmas Eve meal I’m serving, especially since we are having champagne:). I am too crazed with Christmas, it snowballs into a crazy time every year! I could fall in love with this. Absolutely. All I think of when I read this recipe and see that photo is…YUM! I love, love goat cheese. This would make a good appetizer as well. Once I know there’s goats cheese on the plate, I’m there – lovely! I starting to love anything with goat cheese. Thanks for this recipe. I need to start that grocery shopping too. Looks like a terrific appetizer! This looks great! we need a little simplicity in all this hectic-ness. This looks so pretty and delicious, perfect for a celebration. 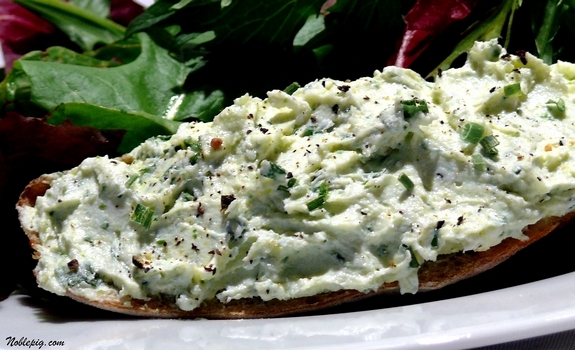 The herbed goat cheese is just the kind of thing I love to spread on crackers or crostini. After reading about your holiday cooking, I want to have Christmas dinner atyour place. Want to send me some pierogis? I love the simple refreshing ingredients in this dish. The presentation is beautiful. Very elegant. This would make a nice starter to a dinner party for sure. Perfect for the holiday entertaining. Thanks Cathy! Yayayay! I love this recipe! Easy and no cow milk!! Yes this salad does asy ‘Dinner Time’…it also says “Eat Me, I’m delicious’! Happy holidays Cathy! Making gluten-free bread or buying some gluten-free baguettes would be so worth it just so I could try this recipe. Very, very appealing, Cathy! Totally loving the lemon goat cheese crostini! That looks delicious. Think this would work as part of a buffet? Cathy – made your chai concentrate and took it to a cookie exchange as my “cookie contribution”. It was a huge hit! Thank you! I LOVE goat cheese! This looks simply delightful! Thanks Cathy! Have a very Merry Christmas and a happy and healthy New Year! Warm goat cheese…. what’s not to love? Have a happy holiday and a wonderful new year! A very fresh treat! Happy holidays!